The exhibit is being held as part of the Kyiv Art Week. Curators invited Georgian and Ukrainian nonconformist artists to take part in this project. Gela Dumbadze, Ambassador of Georgia to Ukraine, is the guest of honor. It will be recalled that the latest large-scale exhibit, that of Niko Pirosmani’s works, was held at the National Art Museum of Ukraine as far back as 2006. And now we can meet Georgian artists again. 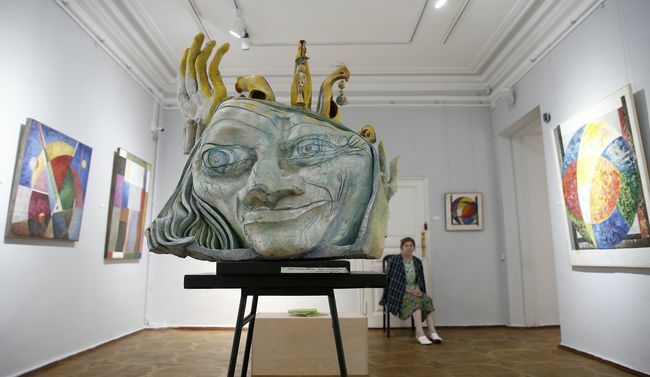 Two good exhibits have opened at the National Art Gallery as part of the Kyiv Art Week, a festival of contemporary art. One is a multimedia installation, “After: Museum,” in a small ground-floor hall. The other, “To Find and not to Let Go,” has combined works by Kyivan and Georgian artists. Curators Maria Vtorushyna and Nino Chanturia invited to the international project only the artistic families that were engaged in nonconformist and unofficial art in the former USSR. Freethinkers in the two Soviet “republics” were victimized for refusing to obey the state, but they still stood their ground in art. In “To Find and not to Let Go,” Ukraine is represented by the works of two artistic families: Vladyslav Mamsikov with Iryna Herasimova and Volodymyr Melnychenko with Ada Rybachuk. Works by Mamsikov, a “living classic” of Ukraine, who painted in the style of “tough realism,” are rather well known (his large-scale solo exhibit was held in Kyiv a few years ago). But I am not sure that Herasimova’s oil paintings have ever been exhibited at all. She created her works under the influence of Western avant-garde – Giorgio de Chirico and Pablo Picasso. The small size of their canvases shows that they were intended to be displayed at unofficial exhibits in residential apartments. Fantastic, worthy of the world’s best museums, sculptures by Melnychenko and Rybachuk, authors of the famous “Wall of Remembrance” (incidentally, this Kyiv Art Week started with the unveiling at Baikove Cemetery of a fragment of the huge sculptural composition poured over with concrete in the 1980s on communist party bosses’ orders), complete the exposition of stagnation-era Ukrainian avant-garde. Even today, the works of Melnychuk and Rybachuk create an unbelievable impression. You feel the same when you examine a Pinzel. You can also notice the influence of Ukrainian baroque tradition on our contemporary sculptors. “Why have I chosen pictures by precisely these Georgian artists for the Kyiv exhibit? Because they are, first of all, my family. You see, I have become a curator and broken with the family tradition,” Nino CHANTURIA, the curator of the exposition’s Georgian part, said, not without self-irony, to The Day. We came to a conclusion that modern-day Georgia and Ukraine are taking a very similar attitude to art – contemporary art is in vogue in both countries, especially among young people. “The first Tbilisi Art Fair, a biennale and a fair of contemporary art, has just finished. It was surprisingly representative and fine,” Nino said proudly. As Chanturia and I found out in the conversation, the impact of Revaz and Leri Chanturia, Karlo and Bezo Grigolia on the history of Georgian contemporary art is as strong as that of Mamsikov Sr. is on the culture of today’s Ukraine. Like our living classic, these Georgian artists need no additional publicity, for their names have become a brand, a guarantee of the highest class in art. Therefore, it is particularly interesting to compare the painting and sculpture of Ukrainian “seventiers” with that of their Georgian counterparts. While Kyivan artists deliberately turned to the traditions of Ukrainian folk painting and applied some techniques of postwar Western art, their colleagues in Tbilisi created non-figurative, symbolic canvases and sculptures. We can say that Chanturia and Grigolia became late-20th-century Georgian cubo-futurists. The Tiflis-born Vladimir Mayakovsky and Ilya Zdanevich may have been painting very similar pictures if they had lived until the present time. Meanwhile, sculptors “on the hills of Georgia” knew very well the names of Alberto Giacometti and Henry Moore even in the 1970s. Wood- or stone-carved, the works of Georgian “living classics” strike you with inner harmony and an amazing, surprising sensation of freedom, which unmistakably “infects” all those who were lucky to mingle with intellectuals of Georgia, the most beautiful (after our Ukraine, of course!) country. But why only with intellectuals, after all?